— and then, optionally, customize it with your own color scheme and background image. 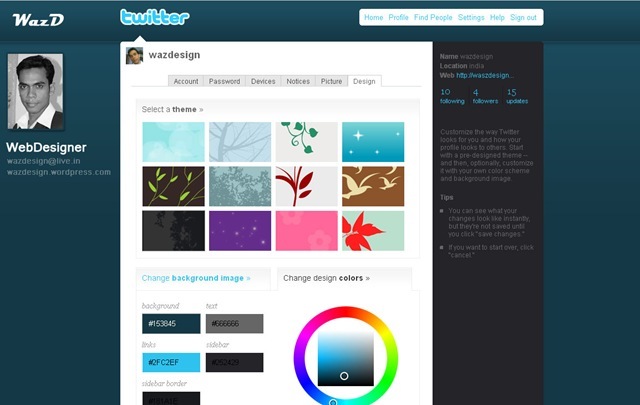 Here is the simple Tutorial How to Create theme for Page . 3. Create Top bar 74px height fill the Layer with same Gradient in reverse order, and Apply Layer style (Drop Shadow =”Only chage Opecity to 25%, rest is Fine”) Use some Good Text and some Style to get the Look as per sample..
4.you can add your Photo.. Important Details and more Information.. Please Download the PSD file and Customize by your self. Feel the Color in BG of Photo shop: background layer.